ArchitectureWeek No. 520 is now available on the Web, with these new design and building features, and more. Our Palladio Awards coverage opens with a beautiful fusion of traditional style with state-of-the-art barrier island disaster- resistant engineering, in a large Texas show house. Compare that experience with a look back at Ando's iconic "4 x 4 House," which shows effective design for flooding in a starkly-beautiful Japanese modern shoreline lookout, on a strikingly small footprint. 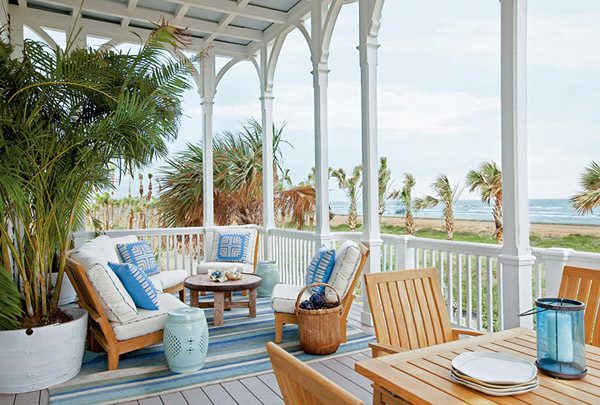 Hurricanes were a primary concern for Michael G. Imber Architects when the firm designed a traditionally styled home for the new Beachtown development in Galveston, Texas. Located on the Gulf of Mexico, the vacation-home development combines New Urbanist architecture and planning with systematic fortification against the fierce storms. Meeting both of those objectives, the 4,000-square-foot (370-square-meter) Beachtown House by Imber's firm - a magazine show home - emulates the delicate carpenter- gothic style of surviving turn-of-the-20th-century Galveston homes while employing contemporary engineering for hurricane resistance. 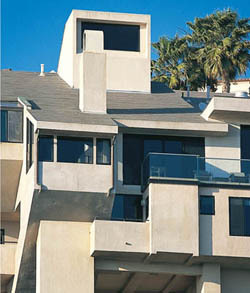 The house's living spaces are located 23.5 feet (7.2 meters) above base flood elevation. Concrete piers and concrete-plank decking were used to create a solid base to resist storm surges, disguised with traditional plaster piers and a lighter wood shuttered infill that forms blow-out walls at street level. Steel shear walls and shear bracing provide additional structural reinforcement, and mildew-resistant materials, such as concrete siding, were used in case of submersion in a flood. 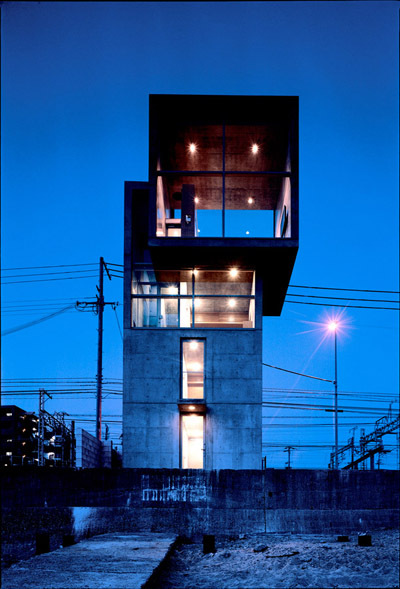 Upon reviewing the techniques that Tadao Ando employed to design the 4 x 4 house, the most striking aspect in its appearance is the configuration of the four floors that form the structure. The taut concrete surface, perforated with the anchors of the formwork, envelops the house and represents all that is associated with the way Ando builds. The western facade is interrupted by four thin vertical windows that light up the stairway behind it (the pivot of the building) and are randomly associated with three other smaller openings. The eastern facade has three smaller square openings, while on the ground floor one can see a vertical window like those included in the western front. To the north is the entrance, above which is a rectangular window, while to the south there are two more windows of different sizes that correspond nicely for the second and third floors. The William H. Neukom Building has opened at Stanford University in Stanford, California. 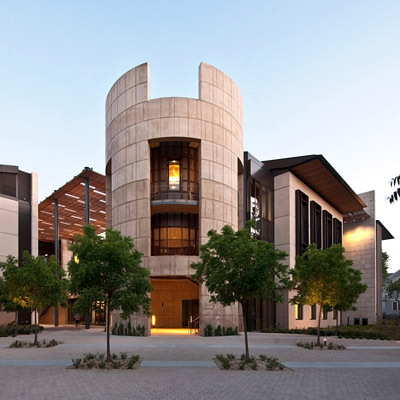 Designed by Ennead Architects (formerly Polshek Partnership Architects), the Stanford Law School building houses a legal clinic, seminar rooms, faculty offices, open work areas, lounges, and conference rooms. Reinforcing the principles of Frederick Law Olmsted's original master plan for the campus, the 65,000-square-foot (6,000-square-meter) building is organized around a central courtyard, with four three-story wings connected by glass-walled bridges around an shaded garden that is elevated atop a ground-floor plinth. A cylindrical tower containing an open-air staircase serves as the building's main entrance. Synchro Ltd. has issued a white paper on the emerging technology of four-dimensional modeling and planning of industrial projects: "4D Modeling of Large Industrial Projects Using Spatio-Temporal Decomposition," by V.A. Seminov and Tom Dengenis. 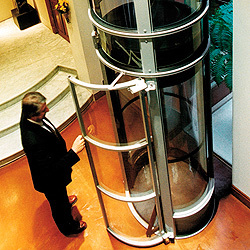 Pneumatic Vacuum Elevators LLC designs and manufactures the vacuum elevator, which combines a smooth vertical cylinder with a coaxial car that moves up and down through air suction. The product line ranges from a single-passenger model to a three-passenger, wheelchair-accessible model. All of the lift systems are capable of up to a 35-foot (10.5-meter) vertical rise over as many as four stops. The footprint is smaller than that of a traditional residential elevator, and no pit excavation, hoistway, or machine room is required. Appropriate for both retrofits and new construction projects. "I must say that the site is amazing... Thanks a lot for your effort in keeping this site going!!!" "Always design a thing by considering it in its next larger context - a chair in a room, a room in a house, a house in an environment, and environment in a city plan." Quote by Eliel Saarinen or Louis Kahn? A 2:12 roof slope is how many degrees above horizontal? 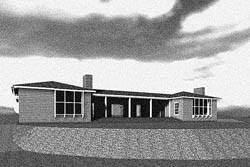 "To accommodate the outdoor orientation of the Butlers' lifestyle, Wurster planned a progression from indoors, or enclosed space, to outdoors. "From the domesticated vegetation of the courtyard, one moved through the Living Porch onto the Living Terrace overflowing into the natural landscape, where one could contemplate the distant views toward the southeast... "